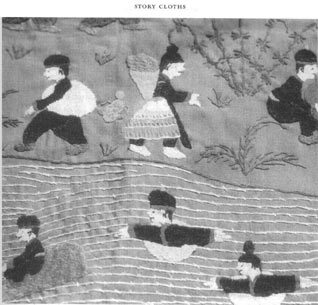 Hmong Story Cloths: Preserving Historical and Cultural Treasures by Linda A. Gerdner, Ph.D, RN, FAAN (Atglen, PA: Schiffer Publishing) 2015. Reviewed by George J. Leonard, Ph.D.
An essential purchase for all school, university and public libraries with collections in Asian and/or Asian American culture and history; Ethnography; the Hmong; Art by Women; fabric arts and crafts; needlework. A recommended purchase for collections involving the Vietnamese War; and surprisingly, geriatrics. Though as lushly illustrated and as large as a coffee-table book, filled with giant photographs of representative and rare Hmong story cloths printed on fine, slick paper, the book is, nonetheless, a work of disciplined scholarship, surely the authoritative work on this important art form to date. Both Gerdner and Schiffer Publishing have made a tremendous investment of time in this book and they are to be congratulated. One of the strangest stories of the Vietnamese War has led to one of the most unusual and moving art forms to come out of Asian America, most fully illustrated in Linda Gerdner’s new book. 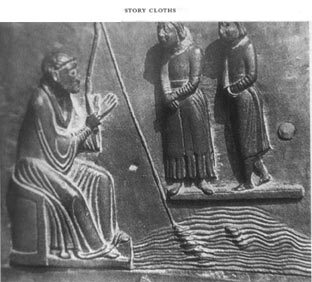 Since the Story Cloths are still unfamiliar to the general public, I will explain what they are at some length, and direct you to Gerdner’s book to see them in full and accurate color. I stumbled across this art in 1988, the way many professors and students have. Twice a year my university holds a crafts fair across the main lawn. San Francisco’s would-be potters, candle dippers, tie-dye twisters, and T-shirt hawkers erect a jumble of ramshackle booths. There, among the shlock and “junque,” two Asian women sat quietly inside a booth festooned with small tapestries. The work was already respected in the small circle of American needleworkers, had acquired an impressive bibliography, and had even been, four years before I saw it, the subject of a museum show at University of California, Davis’s C.N. Gorham Museum. The two women wordlessly began to turn over for me, like pages in a book, the pile of small cloths in front of them: abstract patterns, folkish floral motifs reminiscent of American quilts; tiny animals drinking from pools—a kind of “Noah’s Ark” or “Peaceable Kingdom” theme. Then, to my amazement, across a blue background, marched small figures carrying machine guns through a tropical forest. A tiny stitched jet fired red rockets, and in convincing detail a small hand-sewn soldier knelt for balance, to discharge a heavy bazooka he held on his shoulder (see below). The needleworker had carefully stitched in the bazooka’s trigger guard and its unusual sight. She had sketched a scene she knew. On another part of the cloth, riflemen advanced. From the golden threads of the Kalishnikovs they carried, tiny black ammo clips curved accurately forward. I had never seen anything like this on a quilt. But I had seen something very like it worked in bronze on the Romanesque doors of San Zeno in Verona; and in the Byzantine mosaics of St. Mark’s, in Venice. Those were acknowledged masterpieces of world art. To encounter Real Art on an American college campus among over-aged hippies selling sand candles and black market tapes of the Grateful Dead! Who in the world were these people? And how had they wound up at a Crafts Faire in California? The answer was, necessarily, as unusual as the art. The two women—one of them, Pao Thao, the artist of the war scene—were members of a preliterate Asian hill tribe, the Hmong, who, until a few years before, had been living in their tribal village, high in the mountains of Laos. “Preliterate” means that, although they did not know how to read and write their own language, they were not illiterate; rather, the Hmong (long “o,” as in “roam”) had never invented a way to write or read their language. 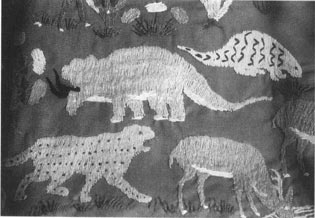 Instead, the tribe’s women sewed the tribe’s cultural lore onto cloth, at which work, over the centuries, they had become fabulously skillful. Their needlework, called Pan Dau (“flower cloth”), spelled many ways, pronounced “PON dow,” was their culture’s central art. You may see very strange spellings, indeed, since the missionaries transliterating Hmong sounds into our alphabet added silent letters to the words’ ends, to indicate what tone the word was spoken in. The silent “b” you might see on the end of Dau in some articles means only, “say Dau in the first tone.” For the record, if you say “Pon! Dau” you’ll come close. The Hmong may once have referred to themselves as “M’peo,” the “embroidery people.” By the 1800s the Chinese had supposedly classified them into 70 (in other accounts, 55) clans and required them to wear certain costumes, to segregate them. If so, the Hmong bested the Chinese by turning the costumes into extravagant works of art—turbans, sashes, caps with extravagant red tassels. Gerdner includes a full section on them. The Hmong today still use the Chinese system of classification by costume: Blue Hmong, White Hmong, Striped Hmong. If these were only costumes that oppressors imposed, why would “the free people” do that? More likely the Chinese tried to classify these unmalleable people by the costumes they found them already wearing. changing colors with H’mong suns and seas. over the red background, which should shine. Yet the Hmong women have been unusually unsentimental about pan dau and have drawn freely on America’s resources. Although in Laos colors were obtained from natural dyes, here in America the Hmong are unabashedly impressed by the durability of synthetic fabrics. They’ve also proved willing to learn marketing. In the Thailand refugee camps, stripped of their occupations as farmers, poppy growers, soldiers, the Hmong men had few marketable skills. The women’s prodigious skill at needlework, however, looked promising. The relief agencies running the camps set up CAMA (Christian and Missionary Alliance), Marsha MacDowell reports, to help the women gain some money and “leadership” skills, as well as to help them preserve memories of Hmong culture. At first the women, provided with materials, produced traditional objects and abstract designs, but CAMA encouraged them to make non-traditional-but marketable-products, like wall hangings and pillow covers. (The Hmong had worn this art, not hung it on walls.) 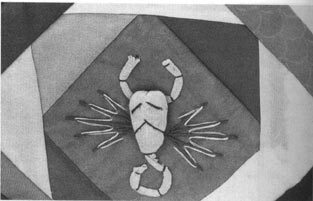 Later CAMA encouraged the women to stitch not only images of insects, say, to protect children, but images of village life back in the hills, or the animals and plants they’d known, or scenes from traditional legends. That would sell in the West. Here, Gerdner’s book is very strong. She devotes a long chapter to their “Traditional life in Laos” and “Hmong New Year,” “Hmong Folktales.” Couples collect banana leaves to wrap rice cakes, which women roll into balls. A Shaman performs a healing ceremony. People pound sticky rice with giant mallets. A whole village dyes hemp fabric. Farmers flee from hungry little bears invading a corn field; farmers attack rats in the rice. These are all memories, and even the rats fleeing the farmers have a nostalgic sheen to them. Photo by George J. Leonard. The Hmong women embraced these ideas (Money! Respect! Independence!) even adding captions and explanations in their newly acquired English. 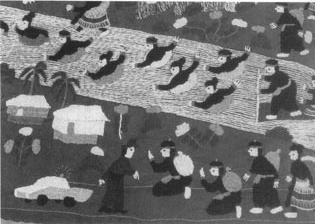 When a story cloth panel carries the stitched caption, “THAT NIGHT THE TIGER ATE THE WIFE AND HE ATE ALL THE CHILDREN CRUNCH CRUNCH” the Hmong women have invaded the Western art world (even if the piece was created in Thailand by relatives according to California Hmong specifications). In this hybrid American form melding their new life and their old skills, the Hmong women become recognizably Asian American. 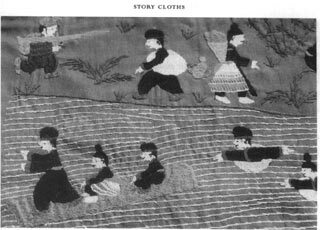 Story cloths are a new art, an Asian American art. These charming folk stories are done by people who have heard all about the prices an American quilt can fetch. Some of what they now produce is kitsch, like latter day Amish art. A Tia Lee “Peaceable Kingdom,” in which every kind of animal comes peacefully to the same waterhole together, contains a kangaroo—which Tia Lee never saw in Laos or California—and, for good measure, a baby-blue triceratops (above). But even their attempts at Bible themes have integrity, since their struggle to comprehend the novel ideas always all through Southeast Asia the Communist victors embarked on genocidal campaigns of “ethnic cleansing.” Here the Leaving Story cloths begin. Woman with belongings on her back, fleeing, at river. “Thirty percent of the Hmong men had died in the war,” Pao Thao told me, explaining her cloth. “My brother-in-law worked for the United States as a signal pilot and was killed,” as were her uncle and cousins. Then the Americans left and the Pathet Lao took their revenge. 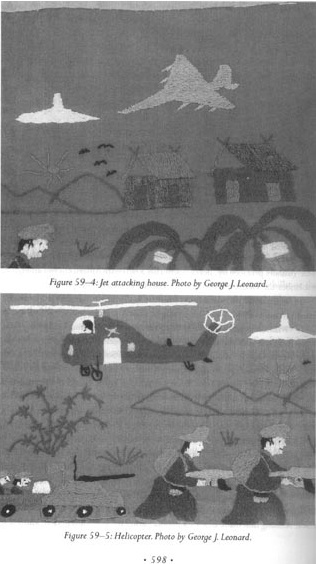 On Pao Thao’s cloth, a jet, afterburner glowing, swoops down on a thatched roof village, all its guns firing (Fig. 59-4). A giant helicopter hovers above the jungle (Fig. 59-5), symbolized by a bamboo tree on the left and a banana tree on the right. Through the jungle comes a tank with the Communists’ red flag, accompanied by soldiers in open transports, running riflemen, and the kneeling man firing his bazooka. Gerdner’s second chapter addresses the genocidal massacres in unflinching detail. 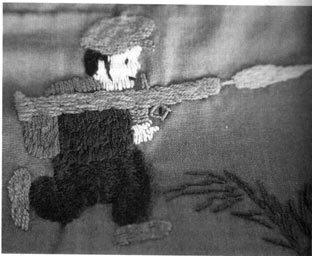 “Execution of two Hmong men by Communist soldiers.” “Violent death of two Hmong men by Communist soldiers.” It is terrible to see, like certain children’s pictures done at Auschwitz, these murders done by little needleworked figures. The men have been buried in dirt up to their shoulders and a Communist has raised a golden sledge hammer to beat them to death. Then the Hmong Exodus begins. As Wang Leng Vang told Viviano in 1976, seven men from his village went into the jungle and cut a trail through it to the Mekong River. It took almost a year to make a trail that would be only seven days’ march long. PaoThao’s cloth shows the men, women, and children hiking through jungle so dense they could not be spotted and napalmed by the Communist forces—whom she always identified as “Russians,” by the way. (I have never seen any other reference to Russian involvement but she was adamant, and an eyewitness. That was her village’s experience.) Many Hmong died on the march, she said. “There was no food that the children could eat.” On the cloth, a woman walks beneath—the bamboo with all her belongings strapped to her back, and a water jug, discarded, lies behind her. The figures have an expression, on this and some other story cloths that Gerdner shows, that Greek historians call “the archaic smile.” The artists, to indicate emotion, create smiles, no matter what the situation. On another cloth, by Va Lee, she has omitted the mouths, and the figures are not improved by it. At the Mekong River, the figures stop. The river, in the Hmong art I’ve seen, is represented by a pattern of white lines, much the way it is in Byzantine Art, and no accident. The thirteenth century artists at St. Mark’s, in Venice—artists of symbolism and pattern, not imitation or illusion—had represented rivers just that way, when Jesus was baptized in the Jordan, or St. Mark traveled by boat. The Romanesque artists at San Zeno, even earlier, chose that image too, for San Zeno fishing (Figs. 59-7). The Renaissance interest in a picture as a window opening out onto three-dimensional space is only one way to think of a picture. The artists at St. Mark’s and San Zeno thought of the picture plane as a two-dimensional surface filled with symbols. Such an art, Kenneth Clark once explained, will find its visual interest in the pattern one can make with the symbols, the combination of the colors and lines. “The less an artifact interests our eye as imitation,” Clark pointed out, in one of his most far-reaching inspirations, “the more it must delight our eye as pattern and an art of symbols always evolves a language of decoration.” Hmong art, until recently an art of abstract symbols in pleasing patterns, still works that way with images, seeing figures as a rhythm of flat black shapes appliqued against the nervous white lines which stand for the river. Hmong art is not a naive art or a “folk” art. While we once condescended to artists who came from technologically inferior countries, it never made any real sense, discussing their art. While we once labeled any form a man made with paint on canvas “art,” but called the same form “craft” if a woman made it in cloth, we do no longer. Politics aside, it made no sense aesthetically. Gerdner is very sensitive on this point. At the Mekong, the figures sit down and blow up inner tubes. The final harrowing part of the journey consisted of the Hmong casting themselves into the Mekong, “swimming with bamboo sticks in our arms to make us float,” as Vang said, and trying to float down the river to Thailand where they would be accepted into refugee camps. Gerdner shows the same method. Pao Thao’s village put people into inner tubes. She reveals her commitment to the pattern of colors here. The tubes were certainly black, but so were the costumes of her Hmong villagers. She makes the inner tubes, therefore, every bright candy color: blue, red, green, yellow, orange. And these rings of color, like fruit flavored Lifesavers, she wraps around the small black figures. Romanesque water St. Zeno fishing. Pao Thao may have made this bold change because the tubes were their salvation: in the river scenes, the small smiling figures seem for once believably happy, and the colors of the tubes underscore their relief at escape. The cheerful colors make you feel the Hmong’s happiness. It would be a great mistake to doubt the artist understood the effect such cheery colors would make; or to underestimate any of these women as artists. They had as much training in their tradition as any modern artist has ever had. Refugees swearing allegiance to America. Other cloths, like Va Lee’s, continue the story. Va Lee shows the large communal housing of the refugee camps. An American official pulls up in a car with a light or a siren. The Hmong kneel before him and raise their hands to swear a loyalty oath (Fig. 59-8). Then they leave, in the back of an open truck, for the airplanes that will take them to the United States. A woman points forward, as in Pao Thao’s cloth, toward something she can see and we can’t. But the difference between Pao Thao’s artistry and Va Lee’s shows when we contrast the parallel final scenes. We notice, now, the natural ease of the figures in Pao Thao’s, the convincing way the children rest their arms on their knees, the way the girl’s skirt bunches beneath her, narrowing its lines, the way the man lunges forward, pointing with his left hand. Some story cloths are as large as a quilt, filled with hundreds of figures. One tells the whole Leaving Story in terrifying detail, ending with a most American of happy endings. The small black figures board planes, fly to the United States, and in the last image, after enduring the battles, strafings, bombings, rockets, and forced marches stitched above, they sit happily, in the last panel, watching a giant television. It is not a sentimental art. You suddenly understand how good it must feel, sometimes, to just sit there, safely, and watch the TV. Gerdner includes a large Happy Ending cloth in which the rescued little figures flock to shop in a large white many-doored building prominently labeled K-MART. The dramatic climax: safety in sight. We airlifted our old allies, the Hmong, out of the wretched disease-filled Thai camps to this country—then scattered them over two dozen states, to minimize the shock to any one state’s welfare and support systems. Someone must have thought it sounded practical. The Hmong, who had survived everything, almost didn’t survive our forced separation of their clans into nuclear families living thousands of miles apart. From tropical forests they were sent to Minnesota winters. Someone had blundered. Once they’d collected their wits, and saved some cash, they began climbing onto Greyhound buses and bunching together in old cars like the Joads in The Grapes of Wrath and heading for California’s Central Valley. There, since the early 1980s, they have regathered, living incongruously among the Steinbeckian landscapes of Fresno and Arvin. Pao Thao was from Modesto, herself. Imagine, plunked down next to Tom Joad and George and Lenny, a preliterate Asian hill tribe that does needlework. California frequently lives up to its reputation for surrealism. The U.S. Census Bureau recorded 52,887 “Laotians” in the United States in 1980—even by then, many of them Hmong, Mien, and other hill tribes. By 1990 that figure had reached 256,727. One more wave came, in 2004-6, and that was that. Twenty years later, Gerdner reports that the 2010 American Census found little change from 1990: “260,073 Hmong-Americans.” Twenty years ago, at least 50,000 refugees sat in Thailand’s camps, waiting for “chain immigration” to bring them to their relatives, now American citizens. Where are they? The last Laotian camp closed in 1997, Gerdner writes, and the Hmong, “illegal immigrants,” were moved to a kind of settlement. So it is not a happy ending, so far. As Frank Viviano reported back in 1986, the Hmong had come to California expecting a chance to farm in the Central Valley. Instead they found “90 percent unemployment; a baffling disease that has seen scores of Hmong men die in their sleep; violent assaults by other minorities who regard refugees as rivals for shrinking public assistance funds; high rates of depression and suicide.” Since Viviano’s piece, the downward pull of American underclass culture has exerted itself on the American-born. When fathers fall from heroes to bewildered welfare cases, boys turn to role models in gangs and the streets. I never met Pao Thao again, but I took a picture of her. By the strangest coincidence, a scale model of the Vietnam Wall was touring American college campuses at that time. It had been erected on the lawn behind the crafts fair, and I took some pictures of Pao Thao against it, holding her story cloth—her own Vietnam War memorial. As Gerdner describes, the story cloths are a “dying art,” which require skills lost in the American generations. In the summer of 1995, taking pictures in China to illustrate the Asian Pacific American Heritage: a Companion to Literature and Arts (NY: Routledge, 1997), I went down to Wanfuxing Street in Beijing, to the People’s Republic’s stores that sell crafts, and particularly the work of the “minzu,” minorities. The PRC sells minzu works much as the State of Arizona might sell Indian works. I was looking for Hmong or Mien needlework. Not story cloths, of course: those are Asian American, and the Leaving Story most American of all. Disappointing. The hill tribes’ works are famous in China, but some bureaucrats had obviously pressured them to create pieces for tourists. I had never heard of the Hmong having any previous interest in stitching portraits of Chinese tourist attractions like the Great Wall. My book, though, needed a photo of the Great Wall, and eventually I wound up out there. I chose the Mutianyu section, far out in the countryside. It is more authentic than the scenes you usually see, shot at the heavily reconstructed Badaling section. In the past few years even Mutianyu had acquired tourists, however, and on the path leading up from the parking lot there were booths set up, hawking souvenirs. There, amidst the shlock and “junque”, I saw booths festooned with tapestries covered with small stitched shapes, staffed by women with faces unlike those of the Han Chinese majority. The tourists walked by them with their noses in the air, certain that anything offered for sale at a tourist attraction had to be bad. I spoke to one of the women, “Are you minz , a minority?” And she replied, in Chinese, “Sir, I am Mien.” Had her clan fled the ethnic cleansing of the 1970s and wandered back through China? There was possibly a settlement nearby, farming in the inhospitable mountains that the Wall sits on top of. I suppose the women went to the Wall to sell their needlework the way they went to the “Crafts Faire” in California. I told the lady I knew the Mien, and I had seen them living in California. She asked about them. I told her they were alive and doing fine. The second part was not quite true, but some day it may be. Lewis, Elaine, and Paul Lewis. Peoples of the Golden Triangle. London and New York: Thames and Hudson, 1984.Thc original specific work on the hill tribes and their original crafts, researched in Thailand from 1968 to 1983. Copiously illustrated. MacDowell, Marsha. “Hmong Textiles and Cultural Conservation.” 1986 Smithsonian Festival of American Folklife Program Book. MacDowell, Marshal. Michigan Hmong Art. C. Kurt Dewhurst and Marsha MacDowell, eds. Michigan State University, 1983. Takaki, Ronald. Strangers from a Different Shore: A History Of Asian Americans. NewYork: Penguin, 1989.Takaki, a Japanese American with no particular expertise in this highly specialized subject augments Viviano (sce below) with his own research. Dated and not recommended. Textiles, Silver, Wood of the Hmong-Americans; Art of the Highland Lao. Davis, CA: C.N. Gorman Museum, University of California, 1984. Included are valuable articles by L. Clair Christensen, Mary H. Fong, Pat Hickman, and others, plus an extensive bibliography of the Hmong’s first years in America. Viviano, Frank. “Strangers in the Promised Land.” San Francisco Examiner-Chronicle, “Image” section August 31, 1986. Viviano was a reporter but a highly professional interviewer. This 1986 article is the earliest serious investigation of the Hmong’s early 1980s journey into California history. It is extraordinary how many scholarly works, like Takaki’s, rely heavily on this single newspaper article. Dr. Gerdner’s book takes the scholarship to a new level.